Triominos, also known as Triominoes, is a cousin of the popular game of dominoes and is played with triangular tiles. The most well-known commercial version of Triominos was released by the Pressman Toy Corp. in 1965. Unlike dominoes, Triominoes uses triangular tiles, and has a unique playstyle. Triominos is designed for 2-4 players. All you need to play is a set of Triominos. Triomino tiles are shaped as equilateral triangles. These tiles have a number ranging from 0-5 on each corner. The tiles exist with similar rules to dominoes, where the three numbers are not allowed to decrease in the clockwise direction. In total, there are 56 tiles in a 0-5 Triomino set. You might be able to find sets with the numbers 0-6. These will have 8 tiles instead. In this guide, we will be focusing on the 0-5 set for 2 players. All the tiles are placed face down and shuffled. The tiles on the board will form the stock or draw pile and will be the source for all further draws. While there isn’t an exact ruleset, most players will choose to start with 10 tiles each. The tiles are picked randomly from the stock. Once all players have 10 tiles, the game will commence. The player who has a triple will begin the game by playing the tile. If both players have a triple, the player with the highest triple will go first. For example, if Player 1 has a triple 3-3-3, and Player 2 has a triple 4-4-4, Player 2 will go first. If both players do not have a triple, then players will call-out the largest tile they have. The player with the higher tile will play out that tile and begin the game. The goal of Triominos is to play all tiles from your hand. This is done by matching tiles with tiles on the board. The rules are similar to dominos, with some added complexities due to the 3-sided tiles. After the first player begins the game with their triple or highest tile, matches are made from the initial tile. Since each tile consists of 3 numbers, the main rule to follow is that each match has to have at least 2 matching numbers. For example, if the initial tile is a triple 4-4-4, then a match is made to a side of the tile. Each side corresponds to two corner numbers, and hence, every match must have 2 matching numbers. Continuing with the example, to match with the 4-4-4, one needs to have a tile that has at least two 4s, such as a 2-4-4. Matching is done by placing the tiles on the corresponding sides. Figure 1. An example of matching, where a 3-3-3 is matched with a 3-3-4 tile. If a player is unable to make a match, they will need to draw tiles from the stock. The player continues drawing until they can make a match. Note that each draw from the stock will incur a point penalty. This is discussed in the Scoring section of the guide. The first player to reach 400 points across multiple rounds wins. Scores are calculated as described in the Scoring section of the guide. 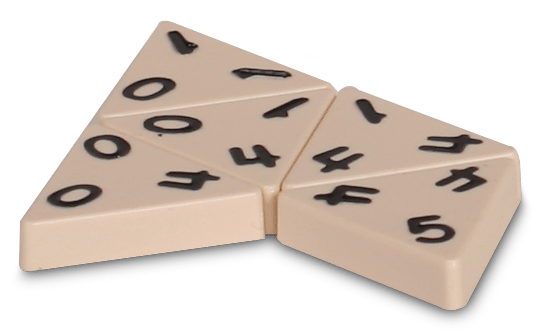 Like dominoes rules, there are rules in place to smoothen the game experience. 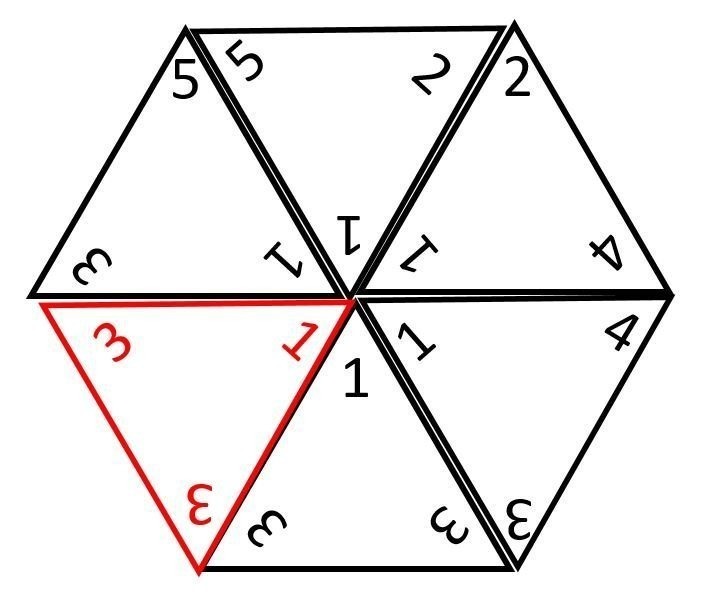 The exception to the rule of 2 matching numbers happens when one needs to complete a shape. For example, a hexagon consists of 6 tiles placed in adjacency. When an incomplete hexagon consists of 5 tiles, a 6th tile is required to complete it. However, this 6th tile needs to match 3 numbers, as opposed to the usual 2. This is because 2 sides are matched at the same time. Each player draws 10 tiles from the shuffled pile. The player with the highest triple begins the game by placing down the triple. On following turns, each player will match tiles to the board. Matches are allowed so long as 2-numbers match between both tiles. If a player is unable to make a match, the player will draw tiles from the stock until a match can be made. The round ends when a player clears all tiles from their hand. Triomino scoring is based on the tile values of each tile. The tile values are based on the score values of each tile. 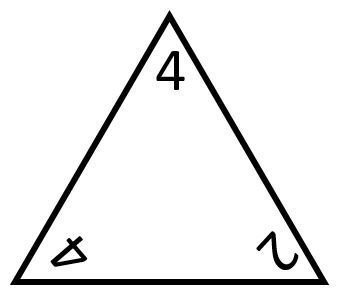 For example, a tile of 4-5-3 is worth 4+5+3=12 points, and a tile of 2-4-4 is worth 2+4+4=10 points. For each played tile, the tile value is recorded on a score sheet. Note that these bonuses stack with the point values for the played tile. 2 -5 + (2 + 4 + 5) = 6 …. Since completing a hexagon provides the highest amount of points, a common strategy in Triominos game is to block hexagons. For example, a hexagon in progress consists of 4 tiles. By choosing the 5th tile carefully, one can block the hexagon. To block hexagons, players must observe the currently played tiles on the board. Since the final tile needed to complete a hexagon needs to have 3 specific numbers, the player can force a block by forcing the final tile to be a previously played tile. Figure 4. Example of a blocked hexagon. Note that the red tile is a duplicate of the tile to its right. Triominoes strategy is about looking ahead, since drawing tiles will be penalized. A tip is to set up future matches. If you have a tile that matches with another tile from your hand, play it out. Block potential hexagons and shapes unless you can be the one to complete the hexagon. Don’t be afraid to draw. The penalty is negligible if you manage to make a match. Are there variations to the game? 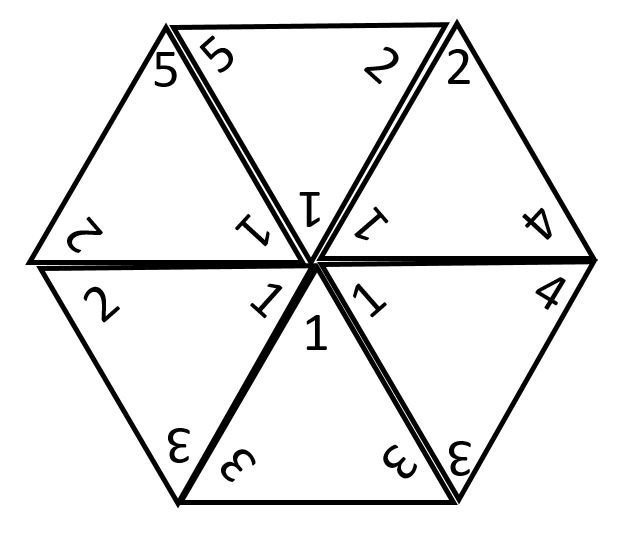 The classic variant of Triominoes Deluxe uses tiles with the numbers 0-5, but variations with tiles from 0-6 do exist. Can you play Triominos online? You can play Triominoes online through an Android application. 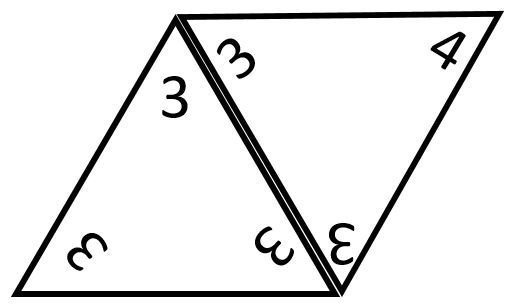 How many pieces are there in Triominos? There are a total of 56 pieces in a Triomino set with 0-5 tiles. How many tiles do you draw? At the start of the game, each player draws 10 tiles.